After leading 10-0, White Buffalos fall to the Dayton 35-10 for second loss of season. 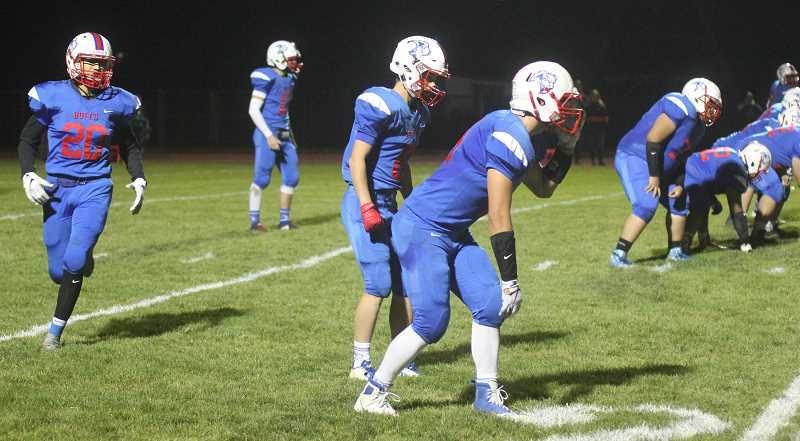 The Madras White Buffalo football program lost their second game of the season with a 35-10 loss to Dayton Sept. 21. Madras scored first and took a 7-0 lead in the first quarter. Madras quarterback Liam White hit Byron Patt on a vertical route for a 38-yard touchdown. White ended the game 8-for-22 with 114 passing yards and one touchdown with no interceptions. Patt led the team in receptions, with three for 100 yards and a touchdown. "He (Patt) is great and one heck of a football player," head coach Kurt Taylor said. "I am so glad he came out and honestly he might be a four-sport all league player. He should be for football; he is that dynamic." "He only practices about 45 minutes a week with the football team," he said. "We get him caught up, he gives his best effort while he is here and then he runs over to soccer, does his soccer stuff. He shows up Friday night and is just a gamer. He is a stud and a great kid." In the second quarter, Madras kicker, Kaegan Prevett was able to make a field goal and extend their lead to 10-0. "Three minutes going into half, Dayton is driving the ball and Dayton is running the ball for about a 12-yard gain and just drops the ball, bounces off his knee and goes in the air," Taylor said. "Erik Boynton (MHS corner), picks it up and starts to run with it and the refs blow it dead." "The refs came together and they stayed with the call," he said. "It really deflated us and our boys didn't know how to respond to such an unusual turn of events. They scored on the next play and it really took the wind out of our sails." Dayton scored on a 26-yard pass, but missed the PAT, cutting down the Buffalo lead to 10-6 at halftime. "We come out of halftime and they just basically took it to us," Taylor said. "We weren't really missing tackles, but really just not executing. We made the right play calls at the right time, but for some reason, we just couldn't get there." "It was really weird to see an event that dictated whether we wanted or had the desire to win the football game," he said. "It was frustrating; that is for sure. I don't really have words for it." Dayton took control in the second half and scored 28 unanswered points. The Pirates scored in the third quarter on a 9-yard run, and were successful on their two-point conversion attempt. They took a 14-10 lead and would later score on a 2-yard run, that time not being able to make the two-point conversion, taking a 20-10 lead at the end of the third quarter. In the fourth quarter, Dayton scored on a 4-yard run and made a two-point conversion for a 28-10 lead. At the end of the game, Dayton scored another touchdown run, this time from 6 yards out. The missed PAT kept the score at 34-10, where it would remain until the game was over. The White Buffalos ended the game with 214 total yards of offense on 57 plays and Dayton, with 384 total yards on 71 plays. Madras had 114 yards in the air and 100 yards on the ground. Treyvon Easterling led the team with 64 yards rushing on 19 attempts, and behind him was Victor Torres with 41 yards rushing on seven attempts. Dayton had a balanced offense, with 180 passing yards and 204 rushing yards. "The game was disheartening, but we can move on and use it," Taylor said. "My hope is that our boys have a sour taste in their mouth from losing two games, to two good opponents and take it into what is real league play now. The Madras White Buffalos moved to 2-2 overall after the Sept. 21 loss. They have their homecoming game this week, Sept. 28, against No. 8-ranked Yamhill-Carlton (2-2), starting a 7 p.m.
"We changed up our practices and are watching more film than we normally do, trying to create more avenues of learning, in hopes that we can fix problems we shouldn't have," Taylor said.